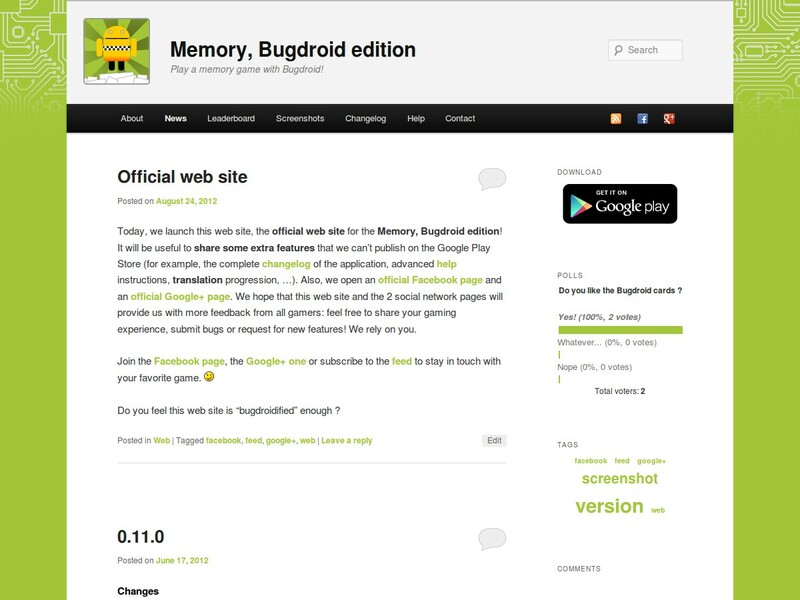 Today, we launch this web site, the official web site for the Memory, Bugdroid edition! It will be useful to share some extra features that we can’t publish on the Google Play Store (for example, the complete changelog of the application, advanced help instructions, translation progression, …). Also, we open an official Facebook page and an official Google+ page. We hope that this web site and the 2 social network pages will provide us with more feedback from all gamers: feel free to share your gaming experience, submit bugs or request for new features! We rely on you. Join the Facebook page, the Google+ one or subscribe to the feed to stay in touch with your favorite game. Do you feel this web site is “bugdroidified” enough ?